Two-watt or 2W tube or valve amps for guitar. The Fender Greta tabletop guitar is the most popular currently produced. Vintage tube amps are also available. Surprisingly loud for their size. The most popular 2 Watt tube amp guitar is the Fender Greta tabletop guitar valve amplifier. 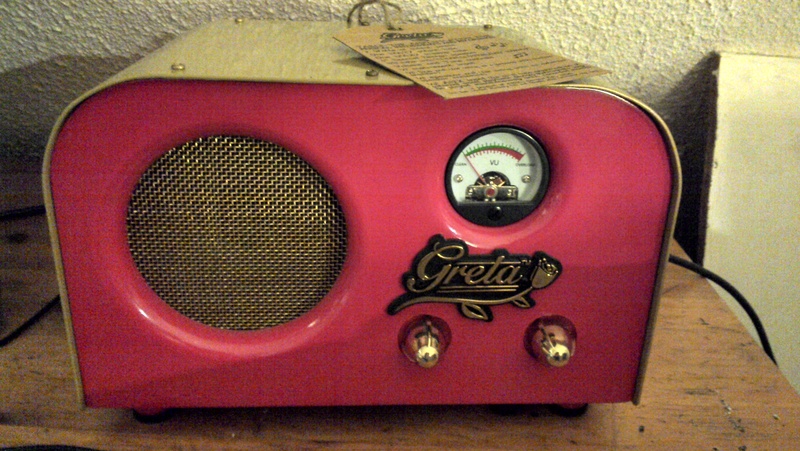 Now discontinued, this vintage-style tabletop 2Watt Greta is the most unusual Fender tube amp ever made. This two-watt tabletop amp has a 4” loudspeaker, VU meter with “clean to overload” indicator and vintage-style volume and tone controls. Its charming red enclosure has front and back wooden panels finished in bright red. The golden colored metal top and sides help with electrical shielding. The “Greta” badge is on the front panel. The Greta features a single 12AT7 output valve and 12AX7 preamp tube, with a 1/4” jack tor your guitar and 1/4” line out jack for preamp use with another amp. The two-watt amp produces a range of low-volume clean and overdriven guitar tones. The 1/8” back-panel auxiliary input is perfect for mp3 player such as iPod. It has a warm mono tube playback sound that you’ll love.